More and more homeowners are looking for alternatives for shade and light rain protection for their back decks and patios. This might be tied to the increased popularity of decks and hot tubs which provide great opportunities for more outdoor living. And while decks and patios increase our ability and eagerness to spend more time outdoors, retractable awnings and patio covers help extend the amount of time we can spend in our decks and patios! The two most common options are becoming awnings and fixed (permanent) covers. Other options such as umbrellas and pergolas exist as well, but awning and covers seem to offer a broadest range of benefits. As with most choices, there are pros and cons of each. Fixed covers allow for permanent, year around extension and protection, with the only possible limitation whether or not they are adequately built to handle unexpected snow loads. If built by a professional contractor, they certainly should, but plenty of poorly constructed covers collapse. For the most part though, fixed covers can be considered to be all-weather, that is if you really want to go outside in heavy rain, snow or extreme cold! 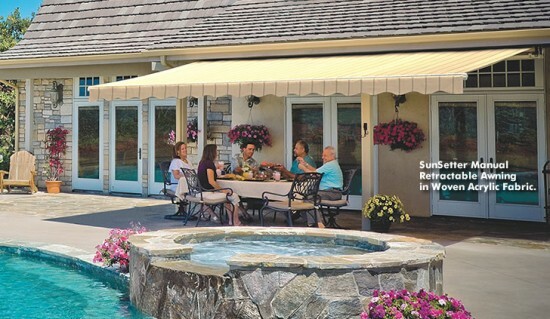 Retractable awnings can be considered three season protection, from both sun and light rain. If you actually want a little more sunlight during winter or even from day to day, their ability to retract can offer you that. Most retractable awnings allow you to easily and infinitely adjust how far they are projected. Fixed (permanent) covers commonly require a building permit. Retractable awnings virtually never require a permit. Do be aware, though, that either might require approval if you live in a HOA with specific restrictions and covenants. One of the big advantages of retractable awnings is that they give you more flexibility if you want full sun or partial as virtually all models can be partially extended. Often with just the touch of a button, you can determine the exact projection of the awning that you desire to block only what you want and not a bit more. If you are looking to hang lots of permanent decorations or hanging plants, fixed patio covers will offer more options. The extra strength of a permanent structure will allow much more weight load. That being said, a common feature on retractable awnings are attached lights which allow for evening and night lighting. Another issue to consider is maintenance. It sometimes can be hard to access the tops of fixed covers because while the overall structure is sturdy, the roofs are commonly light weight materials, such as fiberglass. While these materials are porous and can get dirty, as well as accumulating debris, they can not be walked on, creating some difficulty when time to clean arrives. While awning can also be subject to some environmental staining, they are somewhat easier to wash. This is done by taking a small section at a time and stopping when projecting or retracting it to clean that section. Additionally, debris that falls on them will generally fall off when retracted. However, large branches that fall are more likely to cause damage to a retractable awning that a fixed cover. Color choices and style are an oft overlooked category. Retractable awnings generally offer dozens of color and pattern options as well different material options. Fixed covers typically are only available with one to three color options. These limited options sometimes either shut out too much light or allow too much in with few or no options to modify. Finally, cost is always a big consideration is cost. The good new is that neither are a particularly expensive option. Fixed patio covers are generally going to cost more but if it is being self-constructed vs hired out to a professional, then the labor savings can keep the cost more competitive with a retractable awning. If you think you would like to hear more about whether or not a retractable awning might be right for you, give us a call today. What Factors Determine an Awning Price? Fear of the unknown is often what keeps many of us from pursuing various pursuits, whether an adventure or a purchase. Awnings, especially a top quality, fully retractable awning, may seem to some folks as just too luxurious to possibly be affordable. Yet, they would be surprised upon investigating the price. Due to all of the variables involved it is indeed impossible to say what a specific awning might cost without viewing the exact installation onsite but we can nonetheless provide you with some quick guidelines. In Portland, awnings often get used just as much for providing quick protection against a light shower as much as they are for shade from the sun. We have an abundance of mostly nice days in the Portland area, where there might be an occasional light sprinkle or two during an otherwise fine day. While mostly insignificant, the showers can still be enough to drive activity inside if they occur right when you where planning on dining, reading a book, enjoying your morning coffee or just taking in the view. 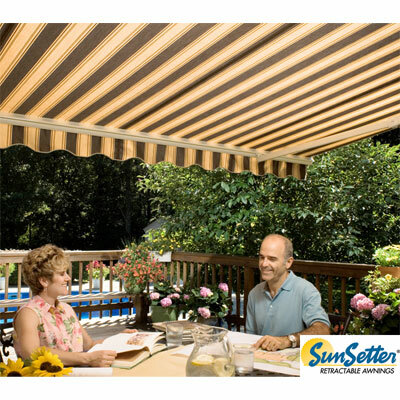 Anyone who has done a little research into retractable awnings usually comes to the conclusion that SunSetter is by far the best value in the Portland Oregon market. You can get the best construction materials and quality plus the most features for the dollar. But a good company never sits still for too long. That is why we chose to be Portland’s SunSetter Awning dealer and installer.